Escondido Mayor Sam Abed and San Marcos Mayor Jim Desmond were among a group of elected officials and residents who urged the San Diego County Board of Supervisors on Monday to join the federal government’s lawsuit challenging California’s so-called sanctuary state law. SB 54, signed by Gov. Jerry Brown in October, limits cooperation between California law enforcement and federal immigration authorities. It prohibits local agencies from holding some immigrants on the basis of federal detainers, asking about immigration status or sharing information with federal authorities not available to the public, among other provisions. Opponents believe the law obstructs the deportation of criminals by federal authorities. 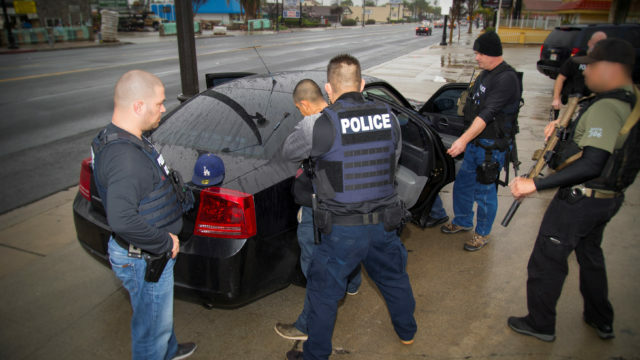 Abed said eight U.S. Immigration and Customs Enforcement agents worked with the Escondido Police Department to target “illegal criminals.” Now, ICE agents are in neighborhoods picking up “Dreamers, immigrants with no criminal records and separating families,” he said. “Wake up, Sacramento, and have the moral courage to say `This is not good for the immigrants they’re trying to protect,'” Abed said. Proponents of SB 54, including the American Civil Liberties Union of San Diego and Imperial Counties, believe it makes communities safer and allows local enforcement to focus on their jobs. Supporters also say it makes undocumented immigrants more likely to report crimes without fear of being detained by federal authorities. Supervisors Dianne Jacob and Kristin Gasper have both indicated in media interviews that they support joining the lawsuit against SB 54. The Board of Supervisors will discuss the issue in closed session Tuesday. A group of San Diego business, law enforcement, philanthropic, environmental, faith and social justice figures will hold their own news conference Tuesday urging the board not to join the lawsuit. That event is set for 10 a.m. at the San Diego County Administration Center, Waterfront Park, 1600 Pacific Highway. DeMaio has rallied sanctuary opponents, and a press conference will be held at 11 a.m. at the park behind iHeartMedia‘s studios, where he is an on-air commentator for KOGO-AM.